Flood water that damages rugs, carpets, baseboards and more in your home can be from any number of sources. ‘Clean’ water may not be as harmful as black or gray water (which already contains contaminants, pathogens, or bacteria), but mold and mildew can set up quickly in flood damaged rugs. Flood damaged rugs affected by gray water – from waterbeds, aquariums, dishwashers, etc. – needs to be cleaned with a professional grade biocide. The commercial products available to homeowners are likely to redistribute any contamination that was present in the water. A rug affected by black water flooding – from toilets, rainwater, and other waste sources –will almost certainly need to be thrown away. We’re the best choice for emergency water damage clean-up because we know the difference between the different types of flood water and the contamination risk for each. 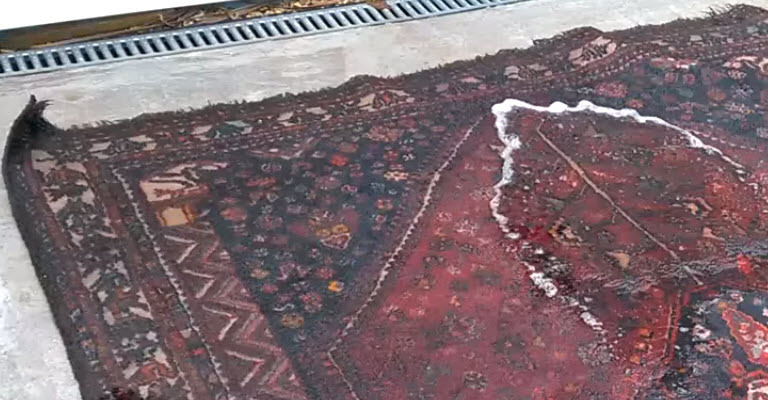 If you know the water is clean and the flooding happened within 24 hours, it’s possible to do the cleanup yourself, but the odds of getting your rug cleaned and properly dried aren’t even close to the results you’ll get from a pro like Smart Choice for water damaged rug restoration! The water damage restoration process is pretty straightforward. As long as the rug hasn’t been exposed to black water, there’s a very good chance that we’ll be able to fully restore it. Inspection – Humidity in the room can affect your rug even after the cleaning is done, so we’ll check the air as well as any electrical concerns before we remove the rug for cleaning. We also check under the rug to see if the floor and rug pad have been affected. Steam Cleaning – Steam cleaning is done at our facility where every factor can be controlled. No soap residue will be left behind in this process (unlike home cleaning methods). Steam cleaning a water damaged rug is the most effective way to protect it against mold, fungi, and bacteria. Vacuum Drying – Drying is probably the most important part of the process, whether we’re doing a routine cleaning or caring for a flood damaged rug. Smart Choice uses special dehumidifiers, hot rooms, and industrial fans to dry rugs faster, leaving less opportunity for growth of undesirable elements. Deodorizing and Sanitizing – Even when the rug has been steam cleaned, it can still have a musty odor. Smart Choice can deodorize the rug to give it a pleasant smell or with an unscented deodorizer. We can also apply fabric-safe sanitizers that will prohibit mold and mildew growth just in case there is any moisture remaining in the flooded area. Post-wash inspection – After any cleaning, Smart Choice pros do a post-wash inspection to ensure that all the water damage has been mitigated and that there’s no rug damage, either from insects, tears, or regular wear and tear. Repairs by Hand or Machine – Rug repairs can be made once the water has been removed and steam cleaning is complete. This isn’t necessary in every case, but the pre- and post- inspections will determine if repairs or needed and if machine repairs will be sufficient or if hand repairs are needed. 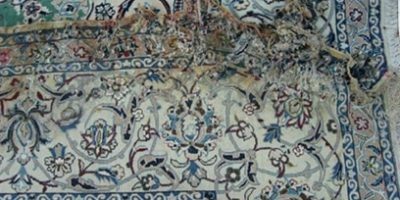 We follow this same professional process each time we do water damage restoration for handmade and machine made rugs so that every rug, no matter how valuable, can be saved. Determine the cause of the flooding so that you can inform Smart Choice when we arrive. It’s extremely helpful for us to know where the water came from so that we know how to proceed. Turn on fans if the weather is good, and run them constantly until we can get our hands on the rug. This will help with mildew and mold prevention. If you can begin drying the rug before we get to it, it will cut the cleaning time significantly. Move furniture off the rug. This step is essential if large furniture is covering a large portion of the rug. Dehumidify the room. Running dehumidifiers will dry out the room and prevent excess moisture from lingering in the room, causing mold and mildew to take hold at a later date. Clean the walls and floor with bleach. You can rub down the baseboards and mop the floor with a bleach solution. If you can’t get the rug to us immediately, you can even clean the back of the rug with a diluted bleach solution – not enough to discolor the rug, but enough to do emergency mold prevention. It’s important that you contact a rug specialist as soon as possible to care for your Oriental rug after water damage, so act fast in order to have the best chance to save your rug!